A historic Charleston Single House, SC colonial-style home, Ravenscroft Inn offers charming accommodations not found in the usual Port Townsend, WA hotels. Besides the warm, hospitable ambiance that only a bed and breakfast can offer, the inn’s unique look and outstanding amenities set it apart from the rest. Its historic and traditional single house architecture is evident in the symmetrical build and the two majestic verandas that look toward Port Townsend bay. Both inside and outside, the inn boasts the traditional, yet updated common areas so prevalent in this southern-colonial style. The great room serves a number of purposes with its open floor plan that encompasses the breakfast area, sofas and wingback chairs in front of a large brick fireplace, and generous kitchen. 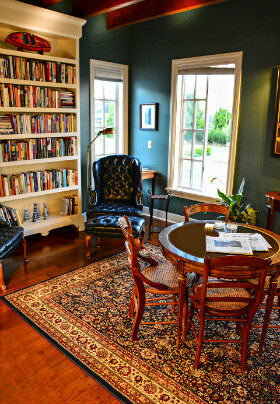 The cozy library is a favorite hideaway and offers a large selection of books, local and national newspapers, and games for our guests’ enjoyment. 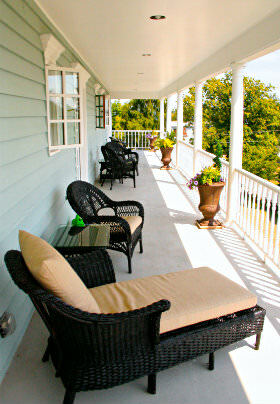 The verandas offer a place to enjoy a glass of wine in the sea air. The inn’s eight total guestrooms/suites reside on all floors of the inn. Each includes our standard amenities and some offer additional perks and features. Complimentary Wi-Fi is available throughout the inn. 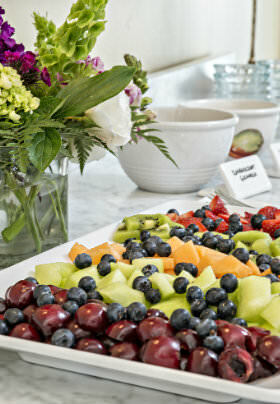 Awaken each morning to a generous cold breakfast selection including fresh fruits, locally made granola or muesli, yogurt, and pastry option. Innkeeper Pauline also offers a delicious warm option to enjoy: she has been known to offer pancakes with seasonal fruit, quiche with leeks and white cheddar, and a roasted pepper, spinach and feta Frittata. Beverages hot and cold are available at any time in the great room, a variety of snacks, fresh whole fruit and afternoon cookies are presented daily and a guest refrigerator in the dining area lets you keep your own cold snacks, chill a bottle of wine or local cider.. China plates, utensils and stemware are available in the kitchen for our guests to use. Ravenscroft Inn is proud to host small events including showers, meetings, retreats, workshops and more. Give us a call; we would love to help make your occasion a success. Smoking is prohibited at Ravenscroft Inn.